I love smoked chicken. It isn’t the flavor that is added from the smoking process, it isn’t the succulent, moist flesh from slow cooking in the smoker. It’s the quality of the fat and skin chunks. I know that it is not popular to be a fan of succulent, tasty, greasy fat; but I really don’t care…it’s good! As it turns out, the fat doesn’t cook away during the smoking process, but it fully cooks, and it sort of crisps up. Gobbling it down is a sublime experience. I don’t get much fat in my typical diet, so I love this stuff. The only thing better than well-cooked fat is flavored fat, and that is exactly where this recipe fits in. In order to build this beauty, the chicken is marinaded in a blend of cilantro, mint and garlic and then basted in a mop of orange juice, lime, garlic, chili, cumin, and oregano while it smokes. 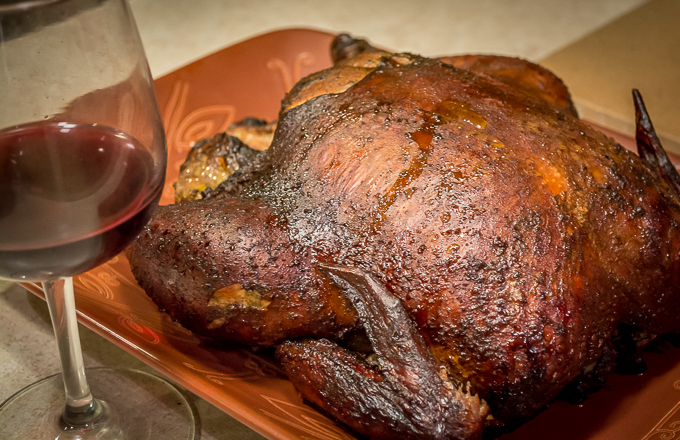 After a couple hours in the smoker, your bird is both beautiful and tasty. The mint comes through as a mild to moderate accent to the pronounced citrus and spiciness from the blend of cumin, chili, and garlic. It’s pretty much wonderful and the best version of smoked chicken that I have cooked. This recipe finds its roots in a similar dish presented in the very good book Smoke & Spice: Cooking With Smoke by Cheryl and Bill Jamison. It is a great study of the techniques behind smoking and barbecue. Highly recommended if you like this type of food. We smoke quite a bit during the summer; smoking chickens, pulled pork, ribs, vegetables, etc. This trend started about 4 years ago when we discovered what a lazy and tasty style of cooking smoking was. To be honest, it would not be quite so lazy if it were not for the advent of modern, electric smokers. These devices make things very simple. The one we have, the Masterbuilt Smoker , was purchased only because it was drastically on sale at a local store. It has some features that are pretty important though; electronic temperature control, good insulation to retain heat, a internal temperature probe for meat. It is was worth the modest investment considering how much use it sees. There are other brands out there that offer comparable quality, just make sure it has the features you want. Anyway, the summary of the method is simple: brine the chicken in salt and sugar solution for a couple of hours; coat with the mint, garlic, cilantro rub and rest overnight in the refrigerator; smoke at 220 to 240 degrees F for about 3 hours, applying the citrus “mop” every 45 minutes or so. Very basic. The chicken is done when the internal temperature comes up into the 165 degrees F range. Getting to this temperature will be greatly impeded by opening the smoker repeatedly, as heat is lost each time you do this. When you mop/baste the chicken, make it fast to keep as much heat in as possible. It is a good idea to get used to the cooking time of your smoker prior to planning an intricately-timed meal for guests, as the cooking time may vary depending on set up and how much heat you loose from opening the smoker. One thing we like to do is toss some shockingly buttered and peppered corn on the top shelf during the last hour of the smoking process. The flavor of smoked, spiced corn is pretty hard to beat and is an excellent means of getting butter into your face. Just make sure you re-wrap the corn in their soaked husks after you take off the corn silk. It helps keep the corn moist. Have fun. Rinse chicken and place in a large stock pot. Prepare brine by mixing water, salt and sugar. Pour over chicken and let rest for at least 1 to 2 hours but not more than about 4 hours. Meanwhile, place wet rub ingredients in a food processor and puree. Remove chicken from brine and drain. Carefully loosen skin and apply wet rub over entire chicken, making sure to coat under the skin, the exterior, and the inside of the chest cavity. Place in a container (such as a ziploc bag) and refrigerate overnight. About 4 hours prior to meal time, preheat your smoker to 220 to 240 degrees F. While the smoker is preheating, remove the chicken from the refrigerator and allow it to come to room temperature. Prepare the "mop" by pureeing ingredients in a food processor or blender. Place chicken in smoker and smoke for about 3 hours, or until the internal temperature reaches 165 F. Apply the mop to the chicken with a brush every 30 to 45 minutes. Work quickly to retain as much heat in the smoker as possible. When done basting chicken, reheat mop to boiling on the stove and lightly reduce for 2 to 3 minutes. Used as a serving sauce at the table.